People often ask me why, as a New Zealander, I care about the fate of the United States. This is what happens when the “free world’ is led by men of the caliber of Barack Obama. Japanese, US and Australian defense officials are increasingly wary of China’s moves to develop port facilities in Pacific island nations, reflecting concern that those facilities could become Chinese navy footholds in the future. Japan, the United States and Australia aim to take concerted action to curb China’s growing influence in the Pacific at the Pacific Islands Forum, which opened on Tuesday, and on other occasions. In late July, a 1900-ton patrol ship from New Zealand was anchored at Vuna Wharf in Nuku’alofa, the capital of Tonga. The wharf for large passenger ferries was developed with full support from China. The pier is about 120 metres long and the sea is about 20 metres deep, making the wharf big enough to accommodate warships. The wharf was damaged by a cyclone that ravaged Tonga in 1982 and left unrepaired. However, China extended to Tonga a low-interest loan totaling about ¥1.67 billion (NZ$345 million) from 2009 to 2012, which covered the entire cost of reconstructing the wharf. The new wharf was completed late last year. Employees of a Chinese company that received a contract to build the facilities were taking photos at the wharf at the time of my visit. In Tonga, Chinese financial support is also used to repair roads, downtown areas and even the king’s palace. Beijing offered another loan to develop infrastructure, including reconstruction of Vuna Wharf, from 2009 to 2012. From 2011 to 2013, China provided another loan to repair roads. According to the International Monetary Fund, China’s loans to Tonga account for about 30 percent of the country’s gross domestic product. An Australian military source said China is trying to shift Tonga over to its side with such support and could make this wharf a foothold for its military vessels. According to media reports, including Papua New Guinea’s Post-Courier online, a Chinese company made a successful bid to expand a fishing port in Madang in northeast Papua New Guinea in 2010. In Lae, south of Madang, another Chinese company won a contract to expand a cargo port last year. In 2011, China decided to extend a low-interest loan of about ¥7.1 billion to the island country. Authorities of Papua Province, east Indonesia, said a Chinese company purchased part of a fishing port in Merauke in the province, which borders Papua New Guinea. Chinese fishing boats have exclusive use of the port and a plan to expand the facilities is under discussion. China has started using ports in the South Pacific, a region over which it exerts considerable influence. In time for a meeting of foreign ministers from China and the Association of Southeast Asian Nations members, Chinese Vice Foreign Minister Liu Zhenmin announced in late August that China will provide funds totaling 3 billion yuan, or about ¥47 billion (NZ$9.7b), to help develop fishing bases and harbor cities in ASEAN countries. If the United States and its allies block key sea lanes, China wants to secure alternative sea routes linking the Pacific Ocean and the Indian Ocean, a source familiar with Japan-US alliance affairs said regarding China’s recent activity. 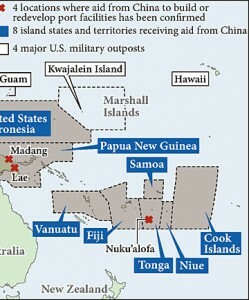 In a time of emergency against the United States, China may use the South Pacific Ocean as a remote area that could threaten the US military, which carries out operations in Asia from its territorial island of Guam, and its military bases. China has already provided support to build and redevelop ports in Sri Lanka, Pakistan and other countries along the Indian Ocean. The network of such Chinese maritime facilities has been dubbed the “String of Pearls,” which surrounds India. In the Pakistani port city of Gwadar, a state-owned Chinese company has taken control of the port from a Singaporean firm. Such a port could serve as a strategic maritime outpost for the Chinese Navy. Beijing appears to have made efforts to establish another “string of pearls” in the Pacific Ocean, where the United States has been a hegemonic power. Fiji is now pretty much a Chinese client state. Tonga is well on the way. If the United States goes under, we all go down. China will rule our region with an iron fist.